Group affiliation: Knighthood of The Light, a division of Western Operations Research and Defense Technologies. (A specialized Elite Sector of the FBI. Rank: Field Agent, GS 13 (Federal Status) Emphasis to confront and contain supernatural/occultic threats. Strength Level: Faith Walker has Olympic athlete level agility, strength, speed, endurance, and reaction time. He is a trained Federal Agent that is accomplished in armed and unarmed combat. Trained in boxing and mixed martial arts in particular Aikido. He is known to incorporate parkour into his agile movements. A noted physical attribute is his majestic gracefulness. While not superhuman, he is as strong as a human being can be. He can lift (press) a maximum of 700 pounds with supreme effort. Keeping himself physically fit he has phenomenal endurance. Known Supernatural Powers: Faith Walker is a spirit driven student and teacher of the Word possessing an astonishing recall of the holy scriptures. His noted traits are love, unyielding faith and wisdom. His gifts also include Spiritual Discernment – alerts him to the presences of angelic and demonic forces.The Eye of Fire that allows him to see into hearts of men. His anointing grants a higher resistance to demonic influence and the mysterious faith factor-in times of grave peril. Cross's measure of faith taps into the supernatural to produce miraculous super human results. Weapons: W.O.R.D. Technologies supplies him with a series of combat fitted items.He wears the purple and gold spidersilk uniform which is referred to as the Garment of Praise. 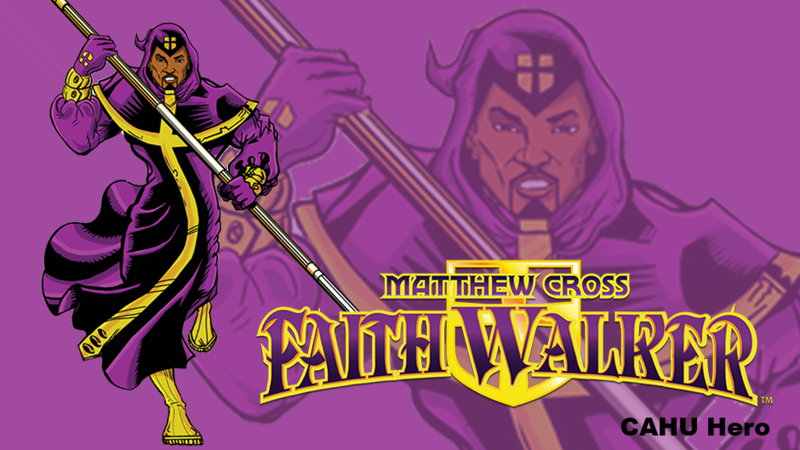 Faith Walker is equipped with The Arsenal of Light that includes: Rod of Aaron, The Crossbow, Fisherman’s net, Ghost-Mode invisibility capabilities and an array of bible themed gadgets and gizmos. He drives/flies a combat ready vehicle called the Chariot.